I grew up in unincorporated East Los Angeles, a few minutes east of Union Station and the Los Angeles River. I recall the Rapid Transit District—the predecessor of Los Angeles County Metropolitan Transportation Authority (Metro)—and their white buses wrapped in 1970s retro-inspired red, orange, and yellow stripes. I remember taking the No. 68 bus from the corner of Gage Avenue and Brooklyn Avenue (present-day Avenida César E. Chávez) into downtown and exiting at Alameda Street, near the grand entrance to Union Station. I was in constant awe of the building and the city surrounding it. My mother, a native Angeleno, appreciated local history and culture and instilled the same kind of fervor in me. I remember going to El Pueblo de Los Ángeles Historical Monument to light candles at La Placita or to eat carnitas tacos with fresh, handmade tortillas at La Luz del Día, and then crossing the street to marvel at Union Station’s painted ceilings and large, ornate chandeliers. My mother always mentioned how she liked the beautiful leather seats inside the grand waiting room. Later, when I was in my 20s, I trained to be an official Union Station docent to guide the Los Angeles Conservancy’s monthly tour of the station. I found out that the leather seats were custom built by the Angelus Furniture Company, a now-defunct, but previously legendary and independent local furniture shop located in East Los Angeles. Coincidentally, the company also supplied much of the furniture in my childhood home. 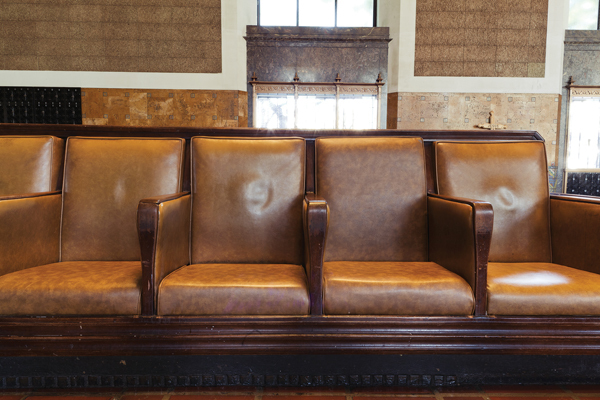 Union Station’s original brown leather seating from Angelus Furniture Company, the now-defunct, but previously legendary local furniture shop located in East Los Angeles. One thing that always struck me about my visits to Union Station was how quiet it was. As a child during the 1980s I vividly remember seeing pigeons flying around the station (especially in the former Ticket Concourse). Whenever my family took the bus from Union Station to Bakersfield, transferring to the Amtrak San Joaquin line to visit family in California’s Central Valley, the trains were nearly empty. At the time I was too young to understand Union Station’s untapped potential, which changed after I embarked on a career in urban planning and design. In many ways my decision to be an urban planner allowed me to understand the forces that promote—and impede—successful public spaces. With time and subsequent experience I put my technical charts and graphs aside and learned how to interpret the relationship between physical form, social experience, and culture firsthand. I learned to read the city. 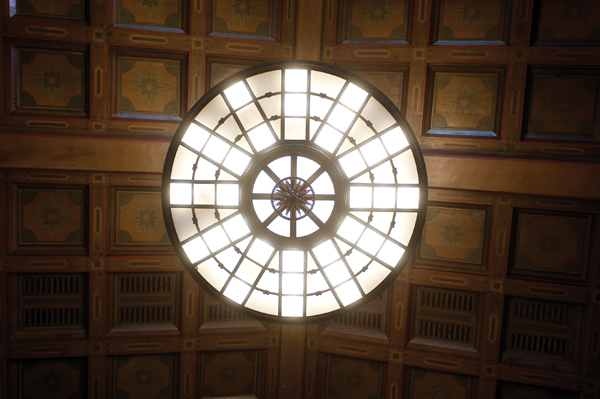 If Griffith Park is Los Angeles’ playground, then Union Station is the city’s living room. By virtue of its site and existence, the station plays the role of public stage, chronicling the everyday experiences of a diverse cross section of visitors and locals from all walks of life. I have heard at the station in the wee hours of the morning, waiting for a FlyAway bus to LAX, maintenance workers sharing stories about how some of the public artworks in Patsaouras Bus Plaza remind them of their respective homelands. I have witnessed how Union Station facilitates personal interactions in the middle of the day, when strangers ask me how to transfer to the Metro Gold Line, so they may visit their new grandson at a local hospital. I have seen this late at night, while walking past entire families waiting in front of the station looking for a place to relax, celebrate, and share the excitement of a hometown win on their way back from Dodger Stadium. La Sombra del Arroyo by the East Los Streetscapers, installed at Union Station’s Patsaouras Bus Plaza in 1996. 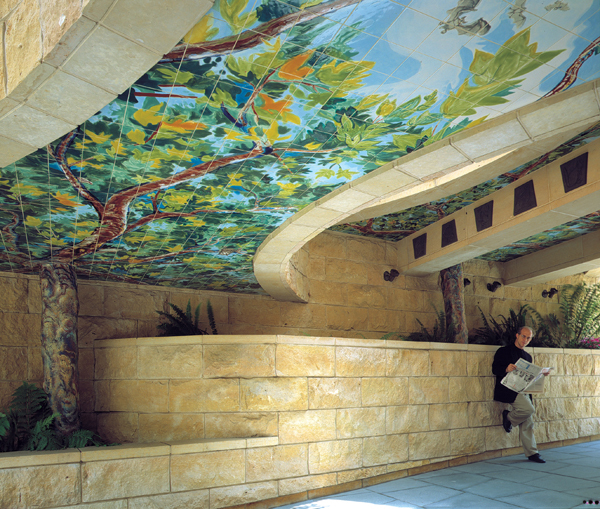 The tile mosaic artwork is part of Metro’s extensive art program. Some of my fondest memories of Union Station stem from the initial impressions—and expressions—I would witness while my tour group assembled on Saturday mornings. A few were tourists visiting the station for the first time. They either excitedly tried to visualize their favorite scenes from famous films that featured the building or expressed their collective wonder at why such a grand structure was so underused. Others were local residents looking to reflect on a bygone era in Los Angeles: they shared stories about adventures in train travel across the country during the 1950s, moving to Los Angeles from the Midwest many decades ago, falling in love, or their first job as a Harvey Girl at the now-closed Fred Harvey restaurant. What became clear, tour after tour, was that the crowd was unified by a common thread: Union Station meant something to everyone. Perhaps this phenomenon is reflective of romanticized depictions of train travel. In the United States, train construction and travel proliferated in the nineteenth century, a time when the country itself was rapidly expanding. Long before airplanes became de rigueur for travel, train stations had already long embodied a position of glamour and romance. And we still feel the vestiges of this nostalgia today. At the turn of the twentieth century, major railroads prioritized utility over design. When train travel grew more popular, train-station design across the United States became more sophisticated. City leaders realized that their stations also served as a public relations tool to showcase the city’s prosperity. In a short period of time, train stations came to be viewed as defining symbols as well as important civic spaces—sites that embodied the social, political, and cultural aspirations of a community. The building of state-of-the-art, centrally located union stations soon became important undertakings for many cities. In Los Angeles, the now legendary father-son architectural team of John and Donald Parkinson envisioned Union Station as a microcosm of the city—equal parts civic space and centerpiece for Los Angeles’ regional transportation hub. The building, after a few decades of underuse, is now beginning to represent a Los Angeles that is weaning off its diet of automobile dependence. Public transit use is on the rise, as is bike commuting. Even a noticeable walking culture in areas previously characterized by a lack of pedestrian activity has been emerging lately. It’s exciting to see Union Station arrive at this juncture at such a critical moment in the city’s history. The embrace of the space, however, is not limited to those who make use of its resources as a hub where all trains and buses meet. 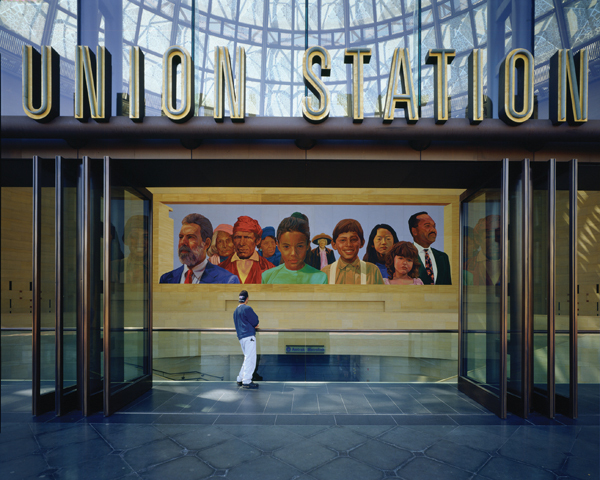 Indeed, Union Station finds itself as a site of piqued public interest, as recent special cultural events—such as live performances and concerts hosted by Metro and the Station to Station event mounted by artist Doug Aitken—have brought Union Station to life. Dancers at Union Station performing Stephan Koplowitz: Red Line Time in April 2013. 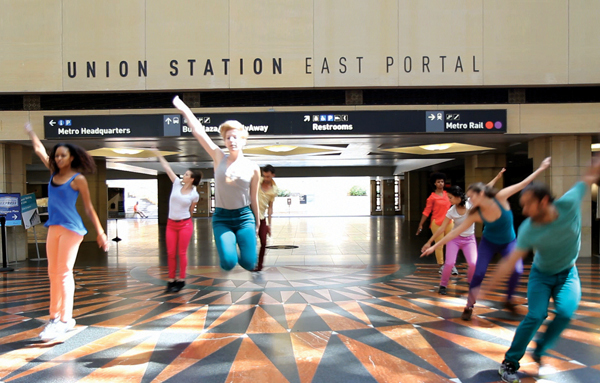 The fleeting dance performances took place at Metro Rail stations as part of a conference on urbanism and modernism at Metro. Photo by Natalie Metzger. Questions remain, however: What does Union Station mean to residents of and visitors to Los Angeles now? What will Union Station mean to them in the future? Stakeholders in Union Station—from city residents to local businesses—have been asking these questions and devising answers. Metro is in the midst of a master planning process, whose purpose is to celebrate the unique history of the site, improve the passenger experience at the station, create a destination for travelers both within and beyond Los Angeles, and prepare for the high-speed rail that is expected to link the entire state. These goals ultimately aim to achieve physical, social, and cultural connectivity at a site that symbolizes different things for different people. The year 2014 will be the first time Union Station has experienced an overhaul of this magnitude since its construction in 1939. This important moment presents an opportunity for Union Station to position itself as an exemplar of twenty-first century civic space. The future of Union Station will respond to the new Los Angeles and reflect on the city’s consideration of and experiments with new models for urban change and growth. This vision hopes to redefine both how people use Union Station on multiple levels, as well as how people navigate Los Angeles. Indeed, plans for the future of Union Station appear to balance long-range redevelopment opportunities with productive, community-building environments. For instance, I imagine the underused historic spaces to be transformed into thriving centers of civic life. The former Fred Harvey restaurant, for example, could become a go-to spot for revelers after a night out, while the Old Ticket Concourse could be used as a part-time concert venue. The North and South Patios and surface-level parking lots might be transformed into popular picnic spots, great for people watching, where Angelenos can linger and enjoy the benefits of the city’s Mediterranean climate. These are only a few imaginings that seem to be slowly becoming reality. 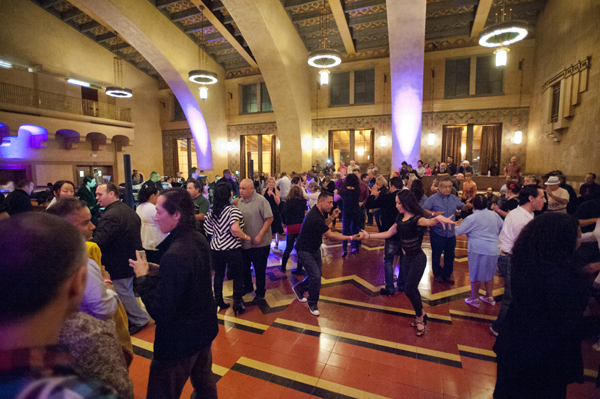 LA Picante salsa band performance in former Fred Harvey restaurant space in January 2014, part of the Metro Presents series of arts and cultural programs at Union Station. Metro has long promoted artwork and other cultural pursuits as part of a broader strategy to enrich the transit environment. The agency encourages a broad range of creative activities—all with the goal of establishing Union Station as a major civic, cultural, as well as transit asset. Recently, the agency created a series of arts and cultural performance programs, Metro Art Presents, as a way to creatively engage transit patrons, attract new riders, and enhance an otherwise routine transit experience. In the future, Los Angeles’ artistic community can continue the course charted by Metro and implement projects that engage Union Station patrons with arts and culture in both temporary and permanent settings. The truest mark of the success of Union Station lies not only in its ability to be an efficient regional transportation hub, but also to be an accessible destination of social and cultural interaction for both local residents and visiting travelers alike. Los Angeles’ attitudes and behaviors about urban culture are undoubtedly changing, and Union Station is well positioned to address transit and public space needs in 2014 and beyond. Other responses—such as the recent opening of nearby Grand Park, revitalization of the L.A. River, and better use of the Los Angeles State Historic Park—reflect investment in generating and reactivating civic and public spaces. Union Station is a key component of this broader “city-making” movement. All great cities have infrastructure that connects our meaningful places, which allow us to connect to one another. The continuing evolution of Union Station—an enduring symbol of Los Angeles—will be an exciting thing to watch. John C. Arroyo is an urban planner and researcher interested in the sociocultural dimensions of civic space, as expressed through equity, immigration, art, and material culture. Arroyo is currently working on his doctorate in urban planning and design at the Massachusetts Institute of Technology. View from Union Station East Portal of the mural City of Dreams/River of History, Richard Wyatt in collaboration with May Sun, Artists. The artwork also includes an aquarium, “river bench” and paver inserts. It’s a train station. Not an art gallery.